When interior designer Agathe Perroy first saw this space, it was actually divided into two micro-apartments, the first (and last) floors of a small nineteenth century labourer's house. Although both floors were tiny (with a total floor size of 42 square metres) and in poor condition, an abundance of natural light — thanks to five south-facing windows — and a quiet environment quickly made her decide to buy. Agathe then began work. First, she removed some of the walls to open up the space. Removing the false ceilings for more height, she discovered perfectly preserved oak beams, which were carefully encorporated into the renovation. When it came to decorating her home, Agathe made good use of the treasures she's discovered in family attics, junk shops or on construction sites. The bath was recovered from a scrap heap, the bed is covered with quilts found at her grandmother's house, and seasonal clothes and accessories are stacked above the closet in boxes once used to ship bananas. 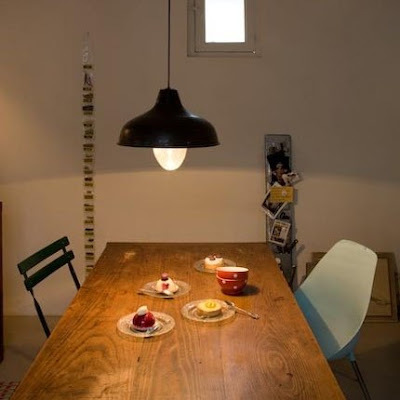 In the dining area, the oak table also serves as the office, and is lit by an enamelled industrial suspension light. Hanging on the wall are bags of spices brought back from India and a galvanized metal hanging garden planter, used to display photos and small objects. The plastic dining chair is 50 years old and was found by Agathe in the street. 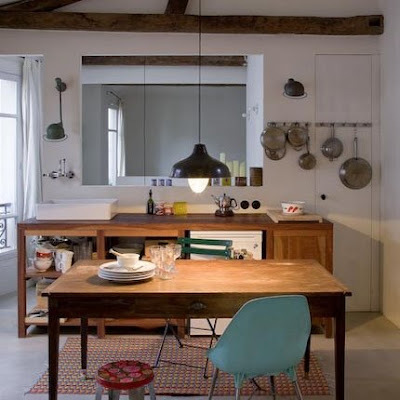 For the kitchen, Agathe had the work area made to measure from exotic wood — the oven is tucked away on the side and the hot plate is also used as a cutting board. A butcher's hook is used to suspend pots while on the wall are two vintage Jieldé lamps. A splash of colour is provided by the African oiled rug on the concrete floor. 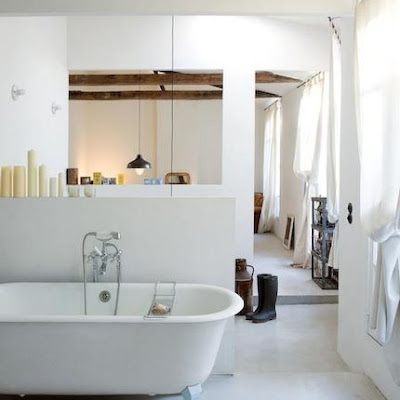 The result of all this is a tiny but infinitely liveable space full of charm and atmosphere. Via Marie Claire Maison, with a (rough) translation by me. A sense of style — in other words, bringing a creative eye to what you wear. What's even better is that you don't need lots of cash to have it, either — just the ability to take what you have and put it together in a thoughtful and interesting way, or by adding an unexpected detail, such as the green gloves in the classic evening ensemble above. 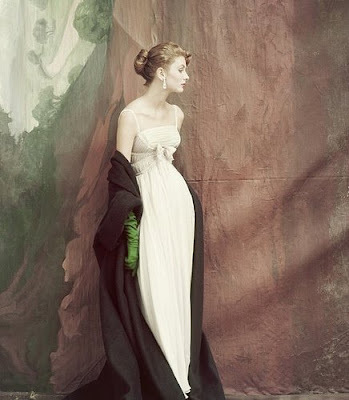 1953 Vogue photograph of Suzy Parker by John Rawlings, via myvintagevogue on Flickr.